The Mad Men premiere is this Sunday, and I’m super excited about it. It feels like it’s been such a long time since the last season, and I’m looking forward to having Mad Men style, wit and character back in my life. To celebrate, this Friday’s Faves is Mad Men themed! 1 :: A classic clutch and vintage gloves are a great start to a Mad Men-themed costume. Even if you’re not dressing out in full-on sixties regalia, they’re a fab way to add some class to your next evening outfit. Luncheonette Vintage has some lovely sets in their Etsy shop. 2 :: To get yourself in the mood for Sunday’s premiere, take a look at this video tour of Mad Men’s costume shop. The hard work and detail that goes into every set and costume is astounding. 3 :: There’s no better dessert than Baked Alaska for getting that sweet sixties vibe. Martha Stewart has the full, step-by-step recipe on her site. 4 :: Give your own bedroom a “Draper” feel with this tufted headboard from Urban Outfitters. Those of you who are more crafty might even want to make your own. 5 :: Artist Dyna Moe has done a fantastic job creating Mad Men inspired illustrations. I love them all, but her paper doll sets of Joan are incredible. Check out her Flickr stream to see her work from the past few seasons. 6 :: Get inspired by this charming Mad Men themed birthday party, put together by Bellafare. From the invitations to the setup and costumes, it’s seriously cool. This past Friday was one of my favorite events of the month: Ladies Supper Club. It’s a monthly dinner that rotates hosts, with each gal bringing one of the courses for the meal (usually based on a theme of the host’s choosing. It’s a wonderful time to let go, catch up, experiment with recipes and have an all-around-good time. If you’re interested in starting your own, I’ll be doing a post later this week with tips to set it up. This post is about chocolate. This month’s theme was (you guessed it) chocolate, with the host serving Seitan in Mole sauce (with a cocoa kick). My course was dessert, which I’ll admit was a little intimidating. I decided that since we were going to be having hits of chocolate throughout the evening, I didn’t want to overdo it–no thick chocolate cakes covered in chocolate frosting (although just typing that makes my taste buds leap). I wanted something that was chocolate through and through, but still fairly light. When I heard the words “chocolate” and “dessert”, the cover of How to Be a Domestic Goddess by Nigella Lawson immediately popped into my head. I began browsing through some dessert recipes on Nigella’s website and stumbled on Chocolate Raspberry Pavlova. I’ve made meringue-based desserts in the past but hadn’t tried adding flavors (like chocolate) or doing a large pavlova-style meringue. It was almost perfect! Almost, because as mouth-watering as the raspberries and cream on top looked, it wasn’t quite chocolaty enough. 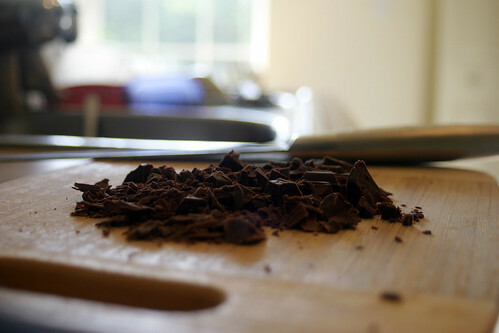 Make the mousse: In a small heavy saucepan, melt chocolate chips with water over low heat; stir until smooth. Stir a small amount of hot chocolate mixture into egg yolk; return all to the pan, stirring constantly. Cook and stir for 2 minutes or until slightly thickened. Remove from the heat; stir in vanilla. Cool, stirring several times. In a mixing bowl, beat whipping cream until it begins to thicken. Add sugar; beat until soft peaks form. Fold in cooled chocolate mixture. Cover and refrigerate for at least 2 hours. Make the meringue: Preheat the oven to 350 degrees F and line a baking sheet with parchment. Draw a 9-inch-diameter circle on the paper (I just traced a 9” round cake pan). You can flip the paper over so the meringue won’t touch the ink/pencil but you can still see the circle. 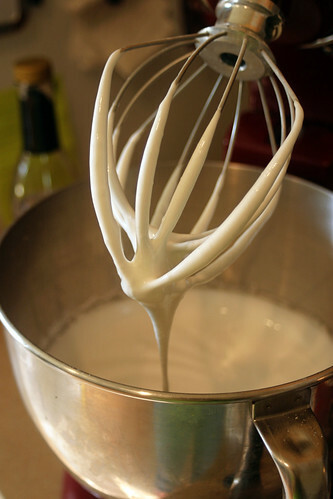 Beat the egg whites with a mixer until satiny peaks form, and then beat in the sugar a spoonful at a time until the meringue is stiff and shiny. Sprinkle the cocoa, vinegar and then the chopped chocolate over the egg whites. Gently fold everything with a rubber spatula until the cocoa is thoroughly mixed in. Secure the parchment to the baking sheet with a dab of meringue under each corner. Mound the meringue onto the parchment within the circle, smoothing the sides and the top with a spatula. Place in the oven, then immediately turn the temperature down to 300 degrees F and cook for one to one and a quarter hours. When it’s ready, it should look crisp and dry on top, but when you prod the center you should feel the promise of squidginess beneath your fingers. 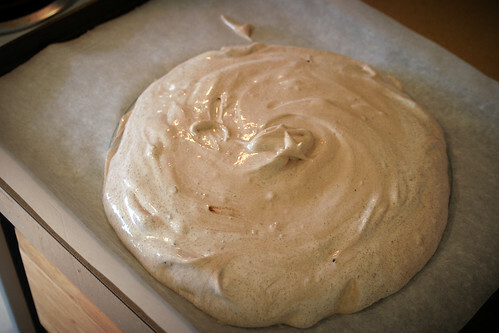 Turn off the oven and open the door slightly; let the chocolate meringue disk cool completely in the oven. When you’re ready to serve, invert onto a large, flat plate and peel off the parchment. Use a spatula or wooden spoon to spread the mousse on top, and grate a piece of dark chocolate over the mousse for a nice finishing touch. This recipe is great when you need to take a dessert to a party—you can bring them separately and quickly put the pavlova together when you arrive. Both the meringue and the mousse can be made up to a day ahead: the mousse should be kept covered in the fridge and the meringue in an airtight container in a cool, dry place. Oh. And it’s fabulously, heavenly delicious. 1 :: We already have the Wise Man print from Arian Armstrong and I would love to add this I Do print to our collection. Arian will customize the 8 x 10 with your wedding date, making it an anniversary reminder as well as a wonderful work of art. 2 :: I love meringue, so this Chocolate Raspberry Pavlova from Nigella Lawson is my idea of a grand birthday dessert. I’m actually making a version of it tonight (with chocolate mousse instead of the berries and cream) for our chocolate-themed Ladies’ Supper Club. 3 :: I’d really like to crochet these beautiful flowers and add a pin so I can embellish my shoulder bags and shirts. 4 :: This retro kitchen timer from Anthropologie has been on my wish list for a long time. The yellow makes me smile and I’d much rather turn this dial than punch numbers into a microwave. 5 :: Since I don’t have any big party plans, my birthday dress would be fun, simple, and comfy. The Art Exhibition dress from ModCloth is (amazingly) still available in my size, so maybe I’ll get to wear it! 6 :: I saw this sweet vintage electric fan for sale on High Market Vintage a few days ago, but it’s since been sold. Luckily, I just found another one on eBay, so maybe one will work its way to my desk soon.